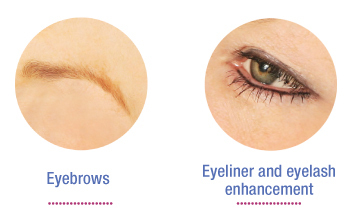 ﻿With advanced new techniques and procedures, semi-permanent make-up will enhance your natural beauty and give your features shape and definition. Also known as micropigmentation, it is the process of applying coloured pigments into the dermal layer of the skin. The procedure is completely safe and used for a variety of semi-permanent cosmetic enhancements to eyebrows, eyes and lips. Women of all ages are experiencing the difference micro-pigmentation can make. After just one procedure you can have stunning, smudge free make-up that will last for several years. Anyone who requires emphasis of the brows will benefit from this procedure and the time saved never having to pencil again. Once a micropigmentation procedure is complete you can swim, do sporting activities or just lie in the sun without the worry of ever again loosing your brows. Choose between a soft textured look or hair simulation. If you have no brow hair or sparse brows due to over plucking, the difference balanced brows can make is amazing. Make the most of your eyes with micropigmentation. From subtle to dramatic, eyelash enhancement or eyeliner can dramatically define eyes, creating great looks that are long lasting and always perfect.